Doris Stauble (1917-2007), an Antiques Dealer in Wiscasset, Maine was known for her original creations using antique containers as the receptacles for her arrangements of Victorian millinery fruit and flowers. They were one-of-a-kind and showed the artistry of the maker and are found in some of the finest collections all over the country. The container might be a wooden trencher with flaws, a wonderful basket with a bit of damage or a spongeware bowl with a little chip or crack that she could cover up with her arrangement . . . Re-purposing antique items that otherwise might not be perfect, yet making a wonderful piece of folk art and giving the object another life. 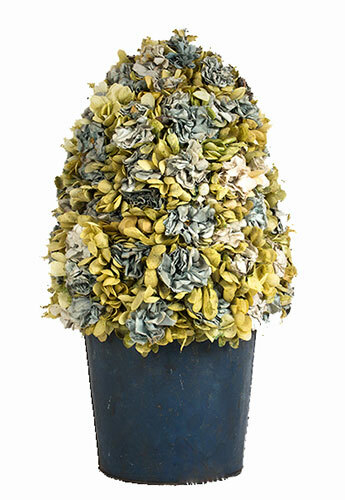 This one is set in a blue-painted tin bucket and the overall height is 26 inches.